Let’s be honest. If you live anywhere within the Polar Vortex it’s hibernation time. I’m pretty much in hibernation mode between now and March. At first I try to fight it–making plans and lists of fun things to do–but I’m throwing in the towel and just letting it happen this year. For me, hibernation means tons of time at home (many weekends included), fires in the fireplace, movies on TV, reading books, plenty of sleep, and a healthy dose of laziness. It also means warm, comforting meals. That’s where the slow cooker really shines. If you ask me what’s the one must-have kitchen appliance it would, without a doubt, be a slow cooker. Seriously. If you’ve been on the fence about getting one, just do it. It’s worth every single penny and doesn’t even require that many pennies. You can score a great slow cooker on Amazon. 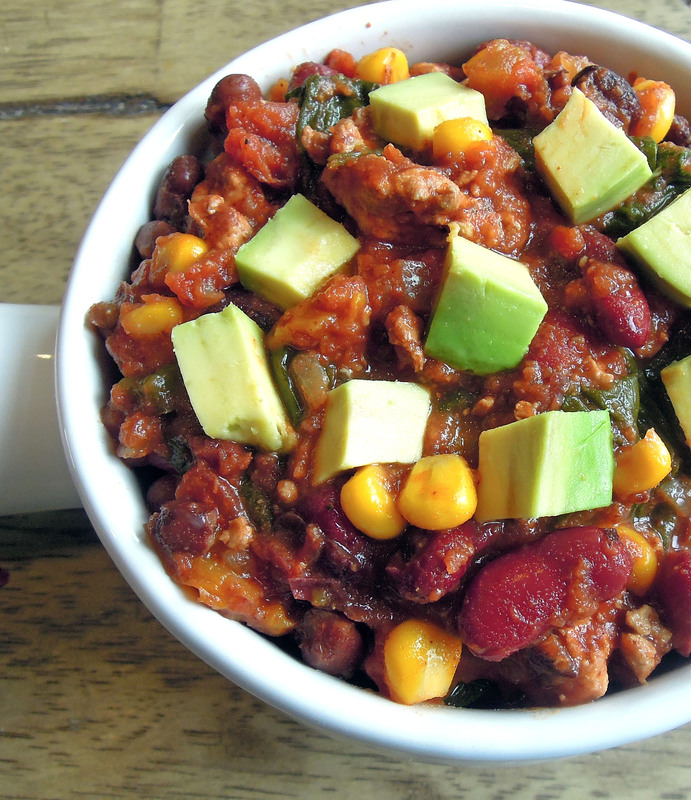 I adore chili and this is a super healthy version you can make that requires minimal prep time. The only thing you have to do is brown the ground turkey in a skillet. Conveniently, you can chop your veggies in the time it takes the meat to cook. Dump it all in the slow cooker and you’re good to go. I even snuck some spinach in there for an extra dose of greens in your day. Heat oil in a skillet over medium-high heat. Add ground turkey to skillet, season with salt and pepper to taste, cook until it starts to brown. While turkey cooks, chop your veggies. 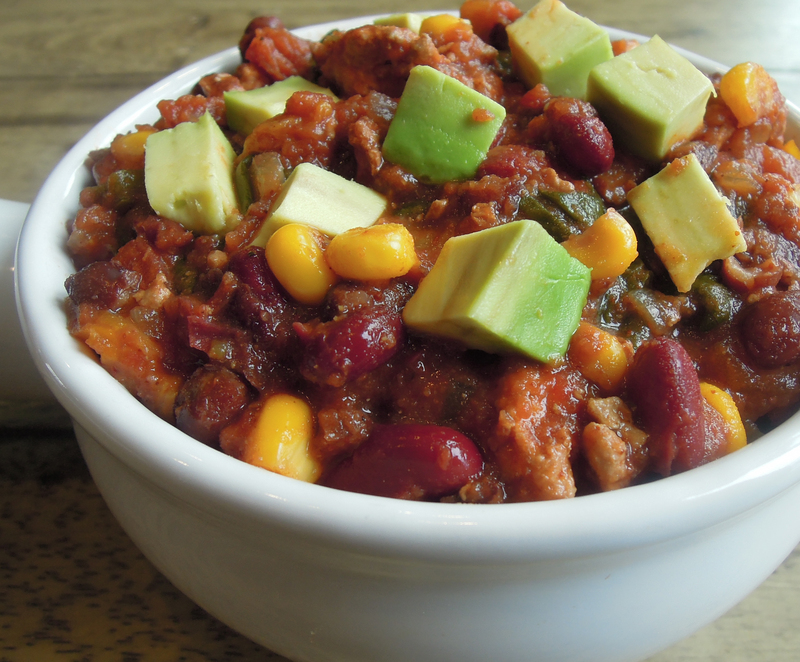 To the slow cooker add jalapeno, onion, pepper, beans, tomato sauce, diced tomatoes, chili powder, cumin, and red chili pepper flakes. Add turkey. Cook on low for 6 hours. Add corn and spinach. Cook on low until spinach wilts, about 10 minutes. Taste and add salt and pepper if needed. Serve in bowls and top with chunks of avocado or any other desired toppings. *Note: I’ve made this recipe using beans and tomatoes in BPA-free packaging (boxes and glass jars). Although the measurements of those packages differ slightly, I’ve tested the recipe both ways and it works so use whatever you have available. This entry was posted in Slow Cooker, Turkey, Uncategorized, Vegetables on January 13, 2014 by Paige Greenfield.